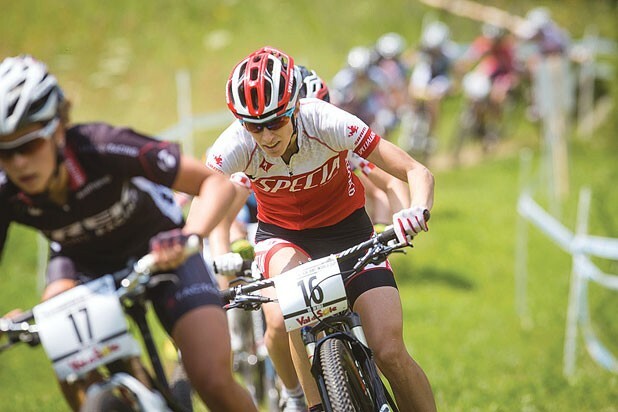 Imagine for a moment that you are one of the mountain-biking superstar sisters Lea and Sabra Davison. You grew up in Jericho, Vt., and became the sort of athlete who can dominate any sport you choose: running, skiing, riding. You make Middlebury College proud. In 2007, you found the Little Bellas nonprofit mountain-biking mentoring program at the Catamount Outdoor Family Center in Williston for girls ages 7 to 14, because at your own races, the boys far outnumber the girls. Little Bellas grows and grows. You’re now nurturing more than 300 budding mountain bikers each year — not only in Vermont but also in Monterey, Calif.; Lakewood, Colo.; Chequamegon, Wis.; and Providence, R.I. You inspire one 8-year-old Little Bella to find the courage to write to Cannondale Bicycle Corporation and ask why they don’t have any girls in their catalog. In 2012, you learn that your beloved Catamount Outdoor Center has been chosen to host the finals of the USA Cycling Pro Mountain Bike Cross Country Tour (Pro XCT) – aka National Finals. The Super Bowl of the American mountain biking. That is, until you realize that, at this race, the top female riders will earn only 65 percent of what the top male riders earn in prize money. Only the top nine women will be paid, while the top 15 men will. The pay is unequal, the standards outdated. If you are Lea and Sabra Davison, what do you do? What you’ve always done: You step up. And win. But in a very nice way. “To have National Finals in my backyard, that’s a dream come true,” says Lea Davison, 30, a Specialized-sponsored rider who competed in the London 2012 Olympic Games. Her sister Sabra, 28, works at Catamount and oversees Little Bellas. Catamount produces the country’s largest and longest-running mountain-bike training-race series, but it’s been unknown to many top riders — until now. The dream of hosting such a big event at the nonprofit outdoor center began to take shape last summer, when Sabra Davison, Catamount executive director Eric Bowker and Catamount member Eric Berliner discussed what it might take to stage a Pro XCT event as a fundraiser. Given their experience putting on the Green Mountain Cyclocross race each fall, the Catamount crew was confident it could meet the challenge. “It turns out USA Cycling was looking to expand the scope of the series, as it had not come east of the Midwest in a few years,” Bowker says. He adds that being chosen to host the race — called the Specialized Catamount Classic — will not only raise funds for the outdoor center but also enhance its reputation as a mountain-biking destination. “It’s important to keep Catamount on the map, and a prestigious event is a good way to accomplish that,” he says. But last spring, when Sabra learned that the August 3 and 4 races had much smaller purses for women, she experienced a moment of deflation. “I said, ‘I can’t run a Little Bellas camp and pay these women less,’” she recalls. So the sisters approached G-Form, a Rhode-Island-based impact-protection company and one of the race’s sponsors. Owner Dan Wyner immediately offered to pony up more money for the top female riders at the Pro XCT. Enough to surpass the men’s pay. Among the pro women who’ve signed up to race at Catamount are Chloe Woodruff (née Forsman), Catharine Pendrel, Mary McConneloug and Judy Freeman. They’ll be joined by top men Todd Wells, Max Plaxton, Jeremiah Bishop and Kohei Yamamoto, among others — representing a strong men’s field, Sabra says. Still, some feedback about the flip-flop has been “very interesting,” Lea adds. By including Little Bellas in the weekend, the Davison sisters, G-Form and Catamount hope to change discriminatory attitudes from the ground up. The young riders will participate in a camp at Catamount the weekend of the race, meeting the athletes “while gaining skills and confidence,” Bowker says. The synergy of antidiscriminatory efforts with a grassroots girls’ program such as Little Bellas offers a multifaceted solution to a multifaceted problem, suggests Lea. Already the event has triggered awareness and momentum beyond the August 3 and 4 races. Bowker reveals that the sponsor of September’s Green Mountain Cyclocross, ENGVT, has stepped forward to offer equal prize money for the women. The Davison sisters see a near future in which women — who typically have to hold down jobs outside of their sport to make a living — receive more travel grants to help offset the costs of competition. And they look to a more distant future when equality at pro races is a given, not an anomaly. The original print version of this article was headlined "Raising the Handlebars."